A church has stood on the site since early times. A Saxon cross formerly of this parish was found in 1938, it now is in the British Museum in London. A mediæval church was demolished in 1839 and on a site slightly more east of the new church which was built in 1841-2 It was designed by the architect George Alexander, of Adelphi, London, in the Neo-Norman style. This style was particularly fashionable in the 1840s and a speciality of George Alexander. He also built Enmore Green Church (Shaftesbury) in 1843, very similar in appearance to Christ Church. The building of the new church in 1841 was at the instigation of Henry Deane then Vicar of Gillingham. 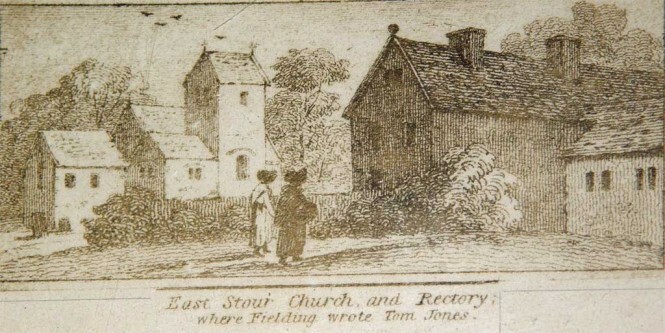 At this time East Stour was a Chapel of Ease in Gillingham Parish, along with West Stour, Bourton, Motcombe and Enmore Green. The church was rebuilt at a cost of £200 and consecrated on 1st April 1942 by Bishop Dennison of Salisbury. (It was one of the first Dorset churches for many years to be consecrated by a Bishop of Salisbury as from 1542 until 1836 Dorset had been in the Diocese of Bristol). The church is cruciform in plan with a central crossing tower, chancel (east end, where the altar is), Nave (where the pews are) and two transepts both with entrance doors and galleries entered from outside. Also there was at this time a West end gallery, again entered from outside. (No entrance door or porch at the North-West end.) The whole church was filled with pews including choir stalls in the chancel. Since 1842 the interior of the church as been reordered several times and appears quite different today, with the latest reordering taking place in the last few years to provide accommodation and facilities for the wider community. Much of this work was carried out by local people on a voluntary basis and included extensive repairs to the nave and tower roof, and the addition of kitchen facilities and a disabled toilet plus the installation of pews into the galleries. The bowl of the font is 12th Century and is carved from Purbeck Marble. It is held up by four green sandstone columns on a limestone base replaced when the church was rebuilt. The organ was built by Messers Bevington in 1877 and first played on the 1stNovember that year. Its original position was on the south wall of the Nave near the crossing tower, but was moved to its current position in the 1930’s when the west gallery was removed. This is a 18th Century carved wooden pelican in piety which rests on an early 20th Century base to make the lectern you see today. The pelican may have come from an earlier pulpit where it sat on the sounding board above the pulpit. This is also early 20th Century and replaces the original 1840’s pulpit in one to the re-orderings the church has seen. Only the small lancet windows in the Chancel and the small painted dove at the west end (we are desperate to get this repaired following vandalism in recent times) are original to the 1840’s church the rest have been added in the late half of the 19th Century. The East End window depicting Christ in the centre, Christ and Mary Magdalene in the left and Christ and Thomas in the right and was installed to the memory of Henry Deane. There is a single bell used to call parishioners to worship. It is a 16th Century bell on the remains of an 18th Century bell frame.